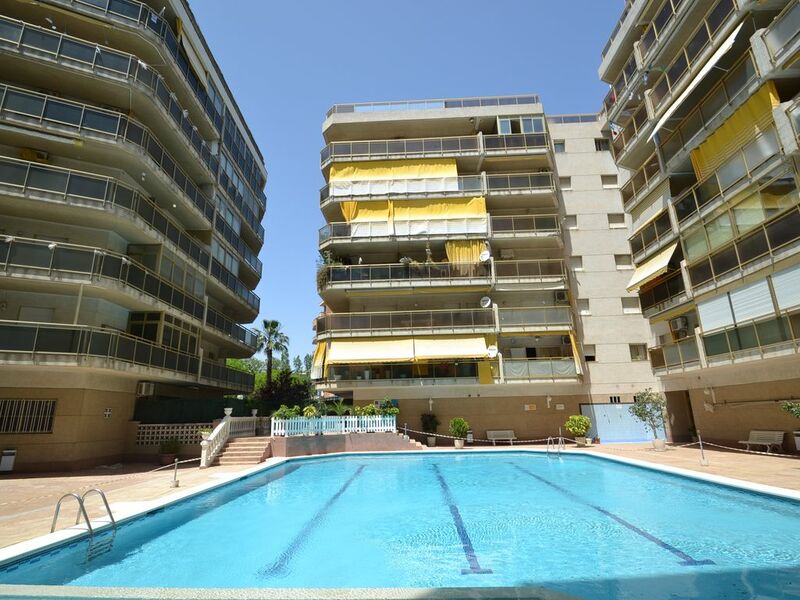 Apartment w/ Wifi and linen - residence w/ sw. pool - Salou's family centre. 1 bedroom - terrace with views sw. pool - centre and 700 m. from the beach. Very cosy apartment in a pleasant family residence with swimming pool, in Salou's urban centre, only a few minutes walk from Salou's main beaches, Playa Llevant and Playa Ponent, from the maritime promenades and from all kinds of facilities. This apartment, on the first floor of the residence (elevators), is bright and functional. Well laid out, it counts with an independent bedroom with double bed, integrated storage closet and wide window, a complete bathroom with a large bathtub, an equipped open-plan kitchen (big fridge-freezer, oven, microwave, vitroceramic cooktop, etc …) with an American bar and stools, opened to the pretty living room with comfortable double sofa-bed, television and a direct way out, thanks to wide picture windows, to the pretty covered and furnished terrace with table, chairs, sliding curtains and a direct view onto the residence's swimming pool, downbelow. Well equipped, for a pleasant stay, with a complete range of household appliances, television screen, outdoor furniture, this apartment includes the linen (sheets and shower towels) as well as an unlimited Wifi Internet connection. For more comfort, it is also possible that you get the air conditioning, available in this property as an optional service which can be suscribed directly on check-in. There is no private parking spot associated to this apartment but it is possible to park your car in the streets behind the residence (school area) where you'll find many free parking spots. If you prefer, it is possible to rent a private parking spot in the hotel next door although it has to be booked in advance and is available with the fee of 12 Euros per day. It stands in a family residence, quiet and friendly, surveyed, with a big community swimming pool and children's area, outdoor showers, elevators and access ramps. Ideally located in the heart of Salou's urban centre, where many families live all year long, it is close to all kinds of shops, supermarkets, restaurants, cafes, bars, close to the covered local market, open every day and offering excellent fresh products, to the weekly market on Mondays, or even to the Renfe train station, perfect to plan a trip to Barcelona. About 650 metres more or less walking down Calle Barcelona, main shopping street in the seaside resort, you'll find Salou's famous Puerto Naútico, sailing port, wits its first shops and restaurants as well as its famous Club Naútico. The renowned Port Aventura theme park with its Ferrari Land, just as the famous Aquopolis water park in La Pineda are easily reachable, only a few minutes from the residence, either by car, by bus or by little tourist train. Catalonia applies a holiday tax, included in the price of the property. Salou is the most tourist seaside resort all over Costa Dorada, standing in Catalonia, about 100 kms South from Barcelona and 10 kms from Tarragona with its cultural patrimony classified by the UNESCO. Deeply appreciated for its climate, its beautiful golden sand beaches, its festive and Mediterranean atmosphere with many leisure activities such as the famous Port Aventura theme park, Salou is today considered as one of the most fashionable seaside resorts all over Spain and, we could say, Europe. - The most animated area where you'll find music bars and nightclubs “el centro turístico”, at the end of the bay, in Salou's Llevant district. - The urban centre, “el pueblo” in Salou's Ponent district facing the sailing port, where most people live all year long. - the quieter district of “Cap Salou”, on Salou's ledge, in a more natural frame and environment, with pinars and creeks which are connected to Salou thanks to a beautiful pedestrian path “El Cami de Ronda” going all along the sea. 10 minutes from Salou, you'll find the beautiful cities of Tarragona and Reus, nice to discover for their architecture and numerous shopping streets, as well as the seaside resort of La Pineda with its Aquopolis water park and the seaside resort of Cambrils with its pretty fishing and sailing port. english, french, spanish, We speak english and are happy to help you. World Vacances Plus is a booking centre between individuals, created in 1998 and installed here on the spot, in Salou. We are here to help you with finding a holiday rental which corresponds exactly to what you're looking for, depending on your enquiry criteria, expectations and needs, and follow you through all the steps of your booking, in English, until key collection; for this property, it will take place at the reception of our booking centre, in Via Roma - Salou (a few streets from your apartment), with a member of our team. Being here on the spot, we personally know each of our properties and their owners and can therefore perfectly answer all your questions. Well equipped and comfortable apartment with the Wifi connection and the linen (sheets and shower towels) included and a few optional services : air conditioning and parking spot. Quiet family residence with swimming pools for adults and children, outdoor showers and elevators. There are many children playgrounds close to the residence. Ideal situation in the family village part of Salou, close to the seaside resort's main beaches, Playa Ponent and Llevant, to the Miramar and Jaume I maritime promenades as well as to the sailing port. For your major comfort, several services are available as options: - Optional air conditioning: 30 Euros per week. - Optional parking spot: 84 Euros per week. An unlimited Wifi Internet connection as well as the linen (sheets and shower towels) are included. Family residence with swimming pool, close to children playgrounds and allowing quick access, walking, to Salou's maritime promenades, to its main beaches (Playa Llevant and Playa ponent) and to all kinds of facilities and services. Optional air conditioning, installed in the living room: 30 Euros per week. The linen (sheets and shower towels) is provided to you for free. Optional parking spot in the hotel next door: 84 Euros per week. An unlimited Wifi Internet connection is included. Fully equipped open-plan kitchen with American bar and stools to be used as a dining area - complete household appliances and many storage cupboards. In the Barcelona residence, there are elevators, ramps although the width of doors and corridors are standard in the residence. In the Barcelona residence, there is a big community swimming pool (12m x 19m) with a children's area, ladders, showers, etc ... From the Barcelona 5's terrace, there is direct view to the sw. pool. Ideal for your family holidays: family residence with swimming pool, close to the beach, to all kinds of facilities and services - complete equipment with Internet and the linen included as well as the air conditioning and a parking both available as optional services. Très bon accueil comme d'habitude, pas de transats dommage. Salou is a renowned seaside resort located 100Km South from Barcelona, and is 10km from Tarragona and its cultural patrimony. The city offers all sorts of activities for tourists, the famous theme park Port Aventura, one of the biggest in Europe. Its equipement for entertainment turned it into one of the holiday places within the country. The touristy area well animated is located northwards, the paradise of the young holiday makers; families tend to appreciate the south of it which is more like a little village. There are about 8 beaches and creeks of sand connected by a long maritime promenade with shops, restaurants, palm trees and fountains, as well as by a pedestrian footbridge called "Camino de Ronda", fitted out a few years ago. Hints and tips will all be sent to you by e-mail in English before your arrival. Access by car: AP7 highway - exit 35 - Salou. Access by train: 500 metres from Salou's train station and 20 kms from Camp de Tarragona's HST station. Access by plane: 10 kms from Reus' airport and 91 kms from Barcelona's airport. Transfers by bus and taxi are available to get there. Taxe touristique incluse. Holiday taxes included. Tasa turística incluida. Un premier acompte de 30% est attendu à la réservation par virement bancaire. A first 30% deposit is to be paid on booking, by bank transfer. Una primera paga y señal de 30% se tiene que pagar a la reserva, por transferencia bancaria. À l'arrivée, une caution de 300 Euros est à remettre en espèces contre un reçu signé - elle est restituée à la sortie après état des lieux. On arrival, a guarantee deposit of 300 Euros is to be provided in cash against a signed receipt - it is returned on check-out after check-up. A su llegada, se entrega una fianza de 300 Euros en efectivo, contra un recibo firmado - se devuelve a la salida tras comprobación.